The Middle East is a place of history and wonder. With careful planning, a trip to this beautiful region with its charming people will open your eyes to the unexpected. Whether you want to discover beaches, historical sites or bustling cities, there are gems in the Middle East waiting to be discovered. Captivating history, beautiful beaches, great shopping, incredible museums, and warm and welcoming people are some of the reasons why we love this region. There’s so much to see in the Middle East, but we’ve narrowed the list to our favourites. Here are a few of the kinds of things you can expect to discover in Middle East. Whether your taste runs to the most luxurious of designers or you're strictly a window shopper, you'll love the sights of Dubai's decadence - including the world's largest mall, and a ski hill inside another! You don't need to be religious to appreciate Israel's sights, as this is a region full of history - from Roman ruins to crusader ramparts. 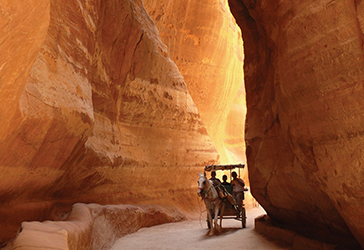 The archeological site of Petra is a delight for the senses - as an ancient city carved out of limestone appears out of a canyon in the middle of the desert. It's a sight not to be missed. Did you know the Middle East has world class snorkeling and diving? From Jerusalem's Red Sea to the untouched seas off the coast of Oman, take the plunge into turquoise waters. The desert dunes near Dubai are ripe for adventure - whether you're taking to the sand by jeep in the day, or indulging in a five-star candle-lit dinner under the stars at night. The Middle East can be just as hot as you'd expect, but there are pockets of respite from the heat. Spring & Autumn (April to May and mid-September to November respectively) offer a generally welcoming climate with beautiful light across the region. If you're travelling in winter, Oman has pleasant temperatures, as do most of the coastal regions of Lebanon. Flighties love to travel, and they've travelled all over the Middle East. Here is a small collection of our favourite things to do when visiting the region. Air Canada's New Non-Stop Routes to Dubai!